Walter Lamar Pou, Jr. beloved husband, father, grandfather, great grandfather and friend passed away on Thursday, January 21, 2016. He was 96 years old. Born in Dallas, TX on September 3, 1919 to Walter Lamar Pou, Sr. and Inez Graham Pou, he was raised in Cleburne, TX. Walter was attending Texas A&M Universtiy for three and a half years, and majoring in dairy husbandry, when he left and enlisted in the Navy Air Corps on April 7, 1941. He was trained as a fighter pilot and a flight instructor. During training at the Naval Air Station in Pensacola, FL, he met Carol Webb, and after a whirlwind romance, they were married on January 28, 1943. Walter was given orders to join the Pacific fleet, and he served in Hawaii during the Second World War. After the war they settled in Cleburne, TX, where Walter worked as a dairy farmer, fireman for the Santa Fe Railroad and business co-owner of Pernell Motor Company. In his later years, he drove a school bus for Cleburne ISD for the fun of it. 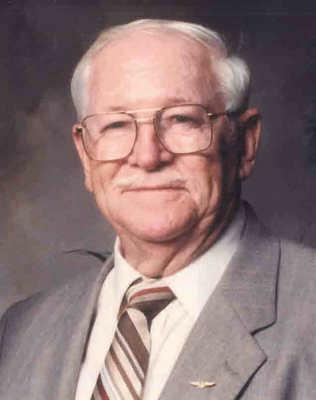 Besides being a wonderful father to his three children and devoted husband to his wife, Walter was an avid fisherman and gardener. He loved his Texas Aggies. He was also a raconteur. Well known for being a prankster, he kept everyone on their toes. Walter was lively and fun! He was preceded in death by his parents, Walter Lamar Pou, Sr. and Inez Graham Pou of Cleburne; brothers, Charles Gray Pou and Wallace Graham Pou, both of Cleburne and his wife, Carol Webb Pou of Pensacola. Walter leaves his adoring children; daughter, Carol Ann Olson (J.D. ); son, Walter Lamar Pou, III (Brenda) and daughter, Pam Ingraham (Tommy). He will be dearly missed by his grandchildren, Jennifer Olson, Wendee Heikamp (Kenny), Eric Olson (Rachel), Lauren Hill (Justin), Caitlin Butler (Dave) and his great grandson "Little Fighter Pilot" Tom Hill. Also, he is survived by his dear sister-in-law, Joyce Webb Nobles. Visitation will be held from 5-7pm on Tuesday, February 2, 2016 at Harper-Morris Memorial Chapel. Graveside Service will be held 10:00am Wednesday, February 3, 2016 at St. John's Cemetery with Rev. Bobby Ellisor officiating. Honorary pallbearers will be Eric Olson, Tom Hill, Justin Hill and Dave Butler and Kenny Heikamp. In lieu of flowers, donations may be made to the Wounded Warrior Project, USO, or Wesley Haven Villa, 111 E. Wright St., Pensacola, FL 32501. We would like to give our sincerest appreciation and thanks to the staff of Wesley Haven Villa and to Regency Hospice for the love and excellent care of our father.